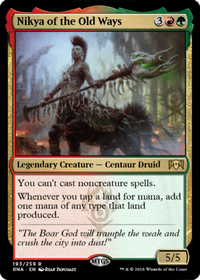 Can spellbreaker behemoth save zendikar incarnate from being countered? 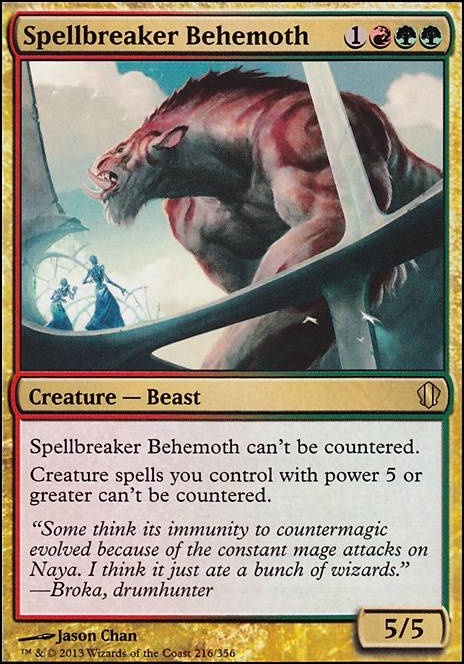 Also, it's not a Dino or a Dragon, but Spellbreaker Behemoth may be a good idea if you are going up against an unusually high amount of counter spells. Including your Commander, there are 17 creatures Spellbreaker will help protect from being countered. Might be worth looking into, just for that alone. I'll save you the Esper and do Naya. Here is my Mardu Soul Sisters deck, btw. Just bought it for $120 with S&H. I pieced the cards out: Non-land on Card Kingdom and lands on TCG Player where you can usually find heavily discounted prices for played cards. I'm personally not a fan of the 11 shipments that TCGP does, but sometimes it's worth it over CK's +$40. I see we are also not going the route of Tarkir's , as I botched that anyway lol. Creature spells you control with power 5 or greater cost less to cast. Creature spells with power 5 or greater can not be countered. 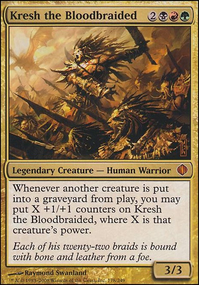 Whenever a creature with power 5 or greater enters the battlefield under your control, draw a card. Sundered by hate and rage, peace is no longer a viable option. War may only be a means to an end, yet an end nonetheless. Esper & Grixis are left. TypicalTimmy on Favorite Voltron Commander and why? I love Atarka, World Render for her massive 12 Commander Damage in the air. Stacking her up is just an incredible force to reckon with. 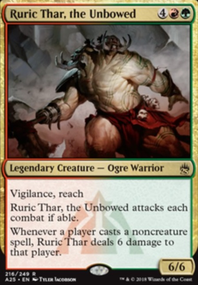 But I feel Gruul has it's limitations in viable protection. Green is good for things like a once-off Fog , sure. Green also ramps and can occasionally draw . Red is good for, in this case, draw as well. 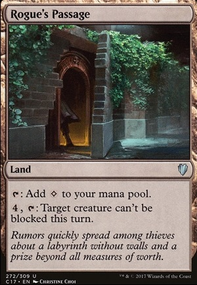 Both can produce mana too, though red is often limited to things such as Geosurge and Seething Song . But protection is rather limited and you are forced to stack up equipment to give her Indestructible or Hexproof, though an occasional green Enchantment or something like Archetype of Endurance can do the trick. 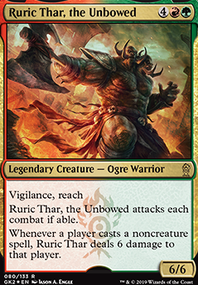 I find you need to balance Gruul Voltron a bit more. You have ways to make her uncounterable - Prowling Serpopard and Spellbreaker Behemoth to name a quick two. Keeping her alive is difficult at first. Commander Tax makes it harder and harder. So politics play heavily into this design, because you want to get her out ASAP and keep her equipped. Not an easy task, mind you. But at the end of the day, I find Atarka Voltron to be unexpected and fun. If I may, I would suggest putting in Llanowar Elves and Elvish Mystic to keep your curve down and help with the ramp as you try to fish for more lands early on. Borderland Ranger is another good budget option that can get you more lands early. Journey of Discovery is a fantastic sorcery for land ramp. Depending on your group's meta, Runic Armasaur might be another cheap option for card draw. I see you have some hydras lined up as possibilities, Mistcutter Hydra is a fantastic card against control decks that run blue and Savageborn Hydra will be absolutely titanic if it hits the field! Polukranos, World Eater is another fun hydra that fights opponents creatures when you make it monstrous. I don't think you should discount having other enchantments either since Nikya tries to discourage that. Zendikar Resurgent has dipped in price and having good card draw on top of ramp can be a win-win. It would be good for you to have some redundancy for making your creatures uncounterable. 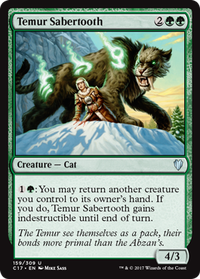 Prowling Serpopard and Spellbreaker Behemoth are both good options and Vexing Shusher if you want to spend extra. Adding something to give creatures haste from the get go is also nice to have outside of your Rhythm of the Wild. Anger is just a solid option at about 50 cents and Urabrask the Hidden does that and then some, too. These are just some of my thoughts as a fellow G/R player. I honestly love Nikya and seeing someone putting a deck together is exciting! Hope some of the suggestions get you on the track you want, whether you take them or not. Spellbreaker Behemoth for those blue metas.